Start off the quests with Travel Trunks along the way that will give out rewards to help you in the next phase. Some rewards will be items needed to explore the Mine, Pond etc. The quest requirements to complete the phases will start to get harder from here on out. You'll also start noticing that the odds to get rare event items will start to not close at 100% as well. Good luck! 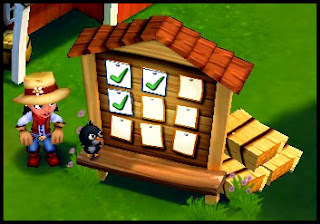 Water x4 - Tap your well or any body of water on your farm. Milk x4 - Poke thy cows for their milk. Here are the two temporary farmhand helpers at the Pappy's Pond during this phase of the event. As you can see they do bump up the chance toget the rare item but you'll need more farmhands to close the circle completely or close to it. And here's an example of the temporary helpers at the Trailhead. The both of them will bring back the item here. If you'd like to increase your odds then add more farmhands. Jack Pennyfeather mentions the rare healing properties of special berries. Who knew we had such things on our farm? Have a barn padlock for completing the quest. Good job! Is it really rare to have berries covered in ice when our farms are blanketed in snow from top to bottom? Silly Jack Pennyfeather. Apparently eating the berries had no effect. Ha! We get 3 Speed Seed nonetheless. Three nice keys to add to our collection. After reading this quest log I've developed a craving for a fruit smoothie. (*Shakes fist at Zynga*) This is why I can't diet! Our newest cut scene has Jack marveling about the ice berries in milkshake form. Great job on completing Phase Three of the Legends of the Farmdog Trail Event! I'll have Phase Four up very shortly. The stakes will get even higher as the ingredients list will increase as well as become harder to find. Remember to have fun. If you're finding this event frustrating it's not worth the stress.